Of all the traditional feasts in India, a thali makes for the perfect assortment of delicious regional dishes on a single platter. The quintessential Indian thali is more like a cultural exploration and makes for a complete meal in itself. Every region across India has its own take on the thali and as you cross geographical boundaries, you will be welcomed with an array of different local delicacies. A typical Indian thalicomprises of a number of dishes and has a little bit of everything - from sides and snacks to mains and dessert, making it a wholesome experience. As diverse and distinctive as they are, all the Indian thalis serve local and seasonal delights and showcase different cooking techniques that make a particular regional cuisine unique. Here are some of the great Indian thalis that are nothing less than a grand feast. Each of them celebrate their region along with its delicacies. 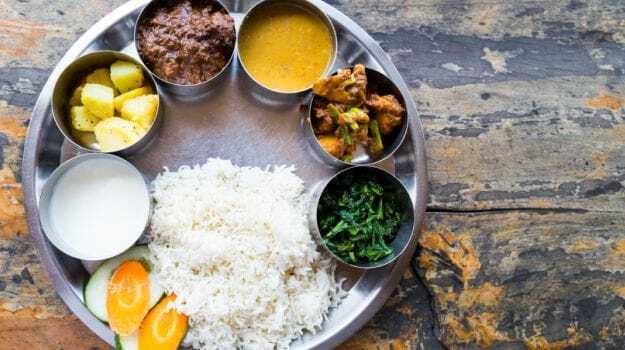 Offering a rustic and earthy experience, you will find the Haryanvi thali loaded with simple delicacies and heaps of homemade desi ghee or white butter. The Haryanvi thali comprises of local staples such as Kachri ki Sabji, Khichdi, Hara Dhania Cholia, Bajra Aloo ki Roti or Besan Masala Roti along with desserts like Alsi ki Pinni, Meethe Chawal or Bhura Ghee Roti. It is often accompanied with a tall glass of homemade lassi to wash down the grand meal. Maharashtrian food is characterized by slightly spicy flavours. The traditional thali will showcase the scrumptious staples of the state which includes Aamras, Kosimbir, Bhakri roti (a millet flatbread), Bharli Vangi (stuffed brinjal), pitla (thick chickpea flour curry), Amti (spicy and tangy toor lentil), Pandhra Rassa (chicken in white gravy), Mutton Kolhapuri (fiery mutton gravy), Sabudana Vada and desserts like kheer or Basundi (sweetened dense milk dessert). Goan food is synonymous with sea food and so a Goan thali cannot be complete without some fish preparations and other local favourites. A typical Goan meal would consist of steamed rice, Sheet Kodi Nustea (fish curry), Kismur (salad made with fresh grated coconut and pan fried prawns), Poi (a butterfly-shaped bread), Mackerel Rawa Fry along with Sol Kadi (kokum-coconut milk drink). Some of the thalis may also include the famous Vindaloo Curry, Rice Bhakri, and Goan Banana Halwa. The Rajasthani thali has a mix of colourful dishes and some local hits that you would hate to miss out on. The elaborate menu consists of Dal Baati Churma, Missi Roti with Gatte ki Sabji, Panchmela Dal, Laal Maas and Bajra Roti along with flavoured buttermilk. For desserts, you have Gondh ke Laddoo and Malpuas to treat your sweet tooth. A traditional Assamese meal begins with a delicacy called Khar, which is a curry made with raw papaya, lentils and powdered dry banana skins. This is followed by Pura (smoked meat), Poitabhat (cooked rice garnished with chillies, onions and mustard oil), Shaak Bhaji, Pitika and fritters known as Bor along with pickles. The meal ends with a delicious Rice Payas or Narikolor Laru (coconut laddoos). Bengal is known for its spectacular thali packed with a delectable variety of delicacies. From Begun Bhaja, Patol Bhaja, Shukto (a bitter sweet medley of vegetables), Shaak and Alu Bhaaja to Cholaar Dal, Bhaat (rice), Maach Bhaja (fish fry), Maccher Kalia (fish curry) and Kosha Mangsho (mutton in thick gravy). To end the meal on a sweet note, you are served a sinful rice pudding called Payesh. Predominantly vegetarian, the Bhojpuri thali from the state of Bihar has a lot to offer. The diverse platter boasts of dishes such as Litti Chokha, Bharbhara (green gram fritters), Dahi Chura (curd with rice flakes), Sattu ka Paratha, Kaale Chane, Gurma (raw mango chutney) and Rasiyaaw (rice dessert) to satisfy your sweet tooth. A piece of Baalushahi won't hurt too! The preparation of Wazwan is an art in itself and it is steeped in the rich and royal culture of Kashmir. This thali includes robust dishes such as Rajma Risemise, Kebab Nadir Shahi (lotus root stuffed with aam papad), Tabak Maaz (fried lamb ribs), Gosht Yakhani, Kashmiri Dum Aloo, Khatte Baingan, Kashmiri Pulao, Al Raita (bottle gourd in yogurt) and rose flavoured phirni to end the feast. Gujarati thali consists of only vegetarian dishes which includes Dal, Kadhi, two to three vegetable preparations like Rigna Palak nu Shaak (spinach in brinjal curry) and Gajar Mirch Sambhaar (pickled carrots and capsicum) along with Khatta Dhokla, Chaas, Methi Thepla and Shrikhand. A typical meal in Chattisgarh consists of rice and rice flour preparations, curd and a variety of leafy vegetables. Some of the dishes served in the thali are Aamat, Rice Pakodas, Dehati Bada (urad dal fritters), Steamed Rice, Muthiya, Fara (crispy balls made with leftover cooked rice), Paan Roti, Dubki Kadhi, Gulgule and Kusli. Who can overlook a heavenly Punjabi thali? The generous use of Makkhan (butter) in most of the dishes signifies a rich Punjabi meal. This thali is a lot like the people in Punjab - robust and full of life. The popular Pujabi thali consists of Amritsari Kulcha or Naan, Pindhi Chhole, Dal Makhani, Jeera Rice, Paneer Makhani and a big glass of Lassi. The non-vegetarian thali may include Butter Chicken, Amritsari Machchi and Naan. A quintessential Andhra meal is usually served on a banana leaf. The delicacies may include piping hot rice smeared with ghee along with Mudda Pappu (lentil), followed by Rasam known as Charu, Avakaya (mango pickle), Parippu Podi (powdered lentil mixed with spices), Dondakayya Veppudu (ivy gourd preparation) and Vankaya Kothamira Kaaram (brinjal preparation). For dessert, you will be served Rava Laddoo or Bandhar Laddoo. 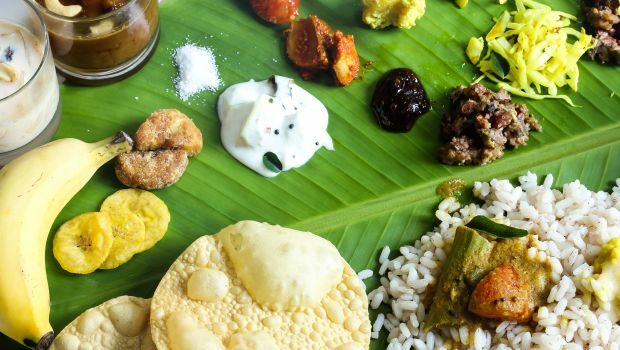 Sadhya is a grand meal in Kerala served on a banana leaf with about 26 delicious dishes. Some of them are Beans Thoran, Aviyal, Pulissery, Vegetable Stew, Erissery, Rasam, Buttermilk Sambhar, Coconut Banana Fritters, Thenga Choru (coconut rice), Pachadis and many more. This elaborate meal usually ends with a creamy Rice Payasam. This list doesn't just end here, there are many more Indian thalis that are worth trying. Do let us know about the unique Indian thalis that you've tried and loved.